Trashigang Dzong or ‘The Fortress of the Auspicious Hill’ was built in 1659, to defend against Tibetan invasions. This imposing fortress is strategically situated high atop a spur overlooking the Dangmechu River. According to legend it is said that upon seeing the Dzong, invading Tibetan armies remarked that the Dzong was “not on the ground, it is in the sky” before retreating. 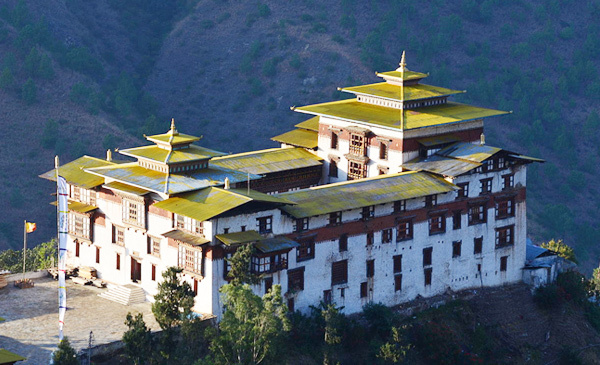 It has been the political stronghold of Eastern Bhutan for over 300 years. Yonphula airport has only one terminal for departure and arrival. Special service request should be made if passengers request to travel earlier than confirmed dates. Priority will be extended to the senior citizens and patients. International Travelers are advice to carry original passports at all times with minimum 6 months validity. Bhutanese Nationals can carry valid Citizenship Identity Card or Voter Identity.